Ram unveiles the new 2019 Ram 2500 and 3500 Heavy Duty Laramie Longhorn Edition luxury pickup truck. The Ram Laramie Longhorn is the world's benchmark for upscale pickup trucks, earning the title Luxury Pickup Truck of Texas from the Texas Auto Writers Association (TAWA) three years in a row. 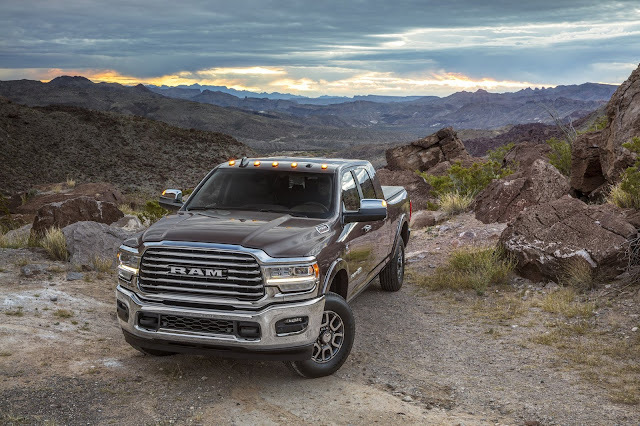 "The new Ram Heavy Duty sets benchmarks in HD capability, ride and handling, luxury, materials, innovation and technology, extending well past any competitive offerings," said Reid Bigland, head of Ram brand. 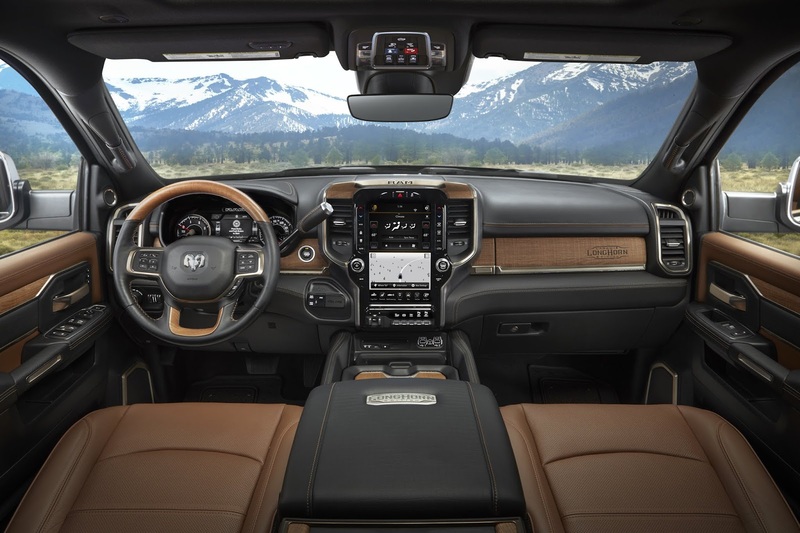 "The Laramie Longhorn is filled with more craftsman-like details, including wood surfaces and 100 percent full-grain leather seats, than any other truck in the segment. Yet as hardworking heavy-duty trucks, the Ram 2500 and 3500 give maximum effort all day, every day with confidence." Layered with premium materials, the Laramie Longhorn carries iconic features and design cues from traditionally handcrafted, time-tested wares, such as the antique pocket watch, hand-tooled leather cowboy boots or a horseman's saddle. The Ram Laramie Longhorn's wood, metal and leather elements are all authentic. Ram Laramie Longhorn's interior trim is the pinnacle of quality with a segment-exclusive hand-wrapped, 100 percent full-grain leather-wrapped dashboard, door-panel coverings and armrests in Southwestern style. Throughout the cabin, a new alligator skin-embossed surface covers the center console, instrument panel, seats and door-panel inserts. Other unique details, such as satin warm-chrome accents with a brushed-nickel metal badge flush with the console lid and new burned-in "Longhorn" branding mark on upper glove box, give the Laramie Longhorn a well-crafted, high-quality feel and appearance. Real barn-wood accents are found throughout the cabin. Wood tandem doors on the center console reflect the heightened attention to detail and provide closed storage. At night, the cabin is accentuated with ambient lighting to create a luxurious and soothing atmosphere for passengers. Laramie Longhorn interior colors include Mountain Brown/Light Mountain Brown and Black/Cattle Tan full-leather seats with contrast piping. Heated full-leather rear seats are standard on Laramie Longhorn. The new 2019 Ram 2500 and 3500 Heavy Duty trucks were designed from the outset to deliver the segment's highest levels of capability without compromising comfort. With 35 all-new and 21 class-exclusive features, Ram combines benchmark performance with strength, luxury and technology. Ram Heavy Duty trucks offer better ride quality than competitors' trucks, made possible by a five-link coil suspension or optional air suspension on Ram 2500 and a supplemental air bag suspension option on Ram 3500.